Looking for a fantastic make-ahead vegetarian canape for your next dinner party? Look not further than my Mushroom and Caramelised Onion Polenta Bites. Want to make them vegan? Swap the cheese for nutritional yeast for a fantastic vegan-friendly canape. Start by making the polenta. Grease a baking tray (I used a 30cm x 20cm tray) and set aside. Then in a medium saucepan bring the vegetable stock and butter to the boil. Gradually whisk in the polenta and reduce the heat to medium low. Continue whisking the polenta until it becomes thick and creamy, around 10 minutes. Remove from the heat and whisk in the parmesan. Pour the polenta into the prepared tray and cover and set aside for 15 to 20 minutes to set. To make the caramelised onions, heat a large frying pan over a medium low heat and add the olive oil before adding the onions and reduce the heat to low. Cook for 10 minutes before adding the balsamic and brown sugar. Cook for a further 10 minutes until caramelised. Set aside. For the mushrooms, heat a large frying pan over a medium heat and add the olive oil. Add the mushrooms and season with salt and pepper. Cook for 10 minutes before adding the garlic and cook for 2 minutes before adding the rose or red wine and thyme leaves. Simmer for a further 10 minutes, or until the wine has all but evaporated. Set aside. Cut the polenta into bite size squares and coat in flour or uncooked polenta (the polenta will provide extra crunch). Heat a large frying pan over a medium heat and add oil. Once the pan has come to heat add the polenta squares and fry for 2 to 3 minutes on each side or until golden. Drain on paper towel. To assemble the Mushroom Polenta Bites top the polenta squares with a small amount of caramelised onion (too much will overpower the mushrooms) and top with the mushroom mixture. To make the Mushroom and Caramelised Onion Polenta Bites vegan omit the parmesan cheese and substitute the butter for olive oil. 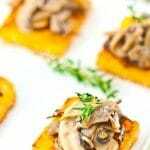 If you would like to make the canapés gluten free dust the polenta squares in uncooked polenta instead of flour. The individual components can be prepared the day before.